The purpose of this short course is to examine the relations among the microscopic structure of minerals and their macroscopic thermodynamic properties. Understanding the micro-to-macro relations provides a rigorous theoretical foundation for formulation of energy relations. With such a foundation, measured parameters can be understood, and extrapolation and prediction of thermodynamic properties beyond the range of measurement can be done with more confidence than if only empirical relations are used. Mineral systems are sufficiently complex in structure and properties that a balance must be sought between rigorous complexity and useless simplicity. 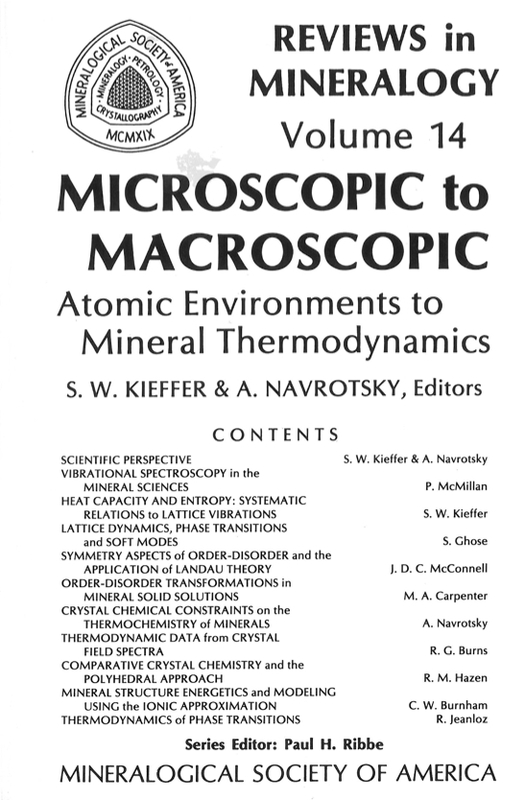 Eventually, even the most rigorous thermodynamic analysis requires simplifying assumptions in order to be tractable for complex minerals, and a firm foundation in the microscopic fundamentals should underlie those assumptions. The most fundamental questions of mineral physics and chemistry are "What minerals exist under given constraints of pressure, temperature, and composition, and why?" The macroscopic thermodynamic parameter defining mineral stability at a given pressure and temperature is the Gibbs free energy. The purpose of this course is to consider the microscopic factors that influence the free energy of minerals: atomic environments, bonding, and crystal structure. These factors influence the structural energy and the detailed nature of the lattice vibrations which are an important source of entropy and enthalpy at temperatures greater than 0 K. The same factors determine the relative energy of different phases, and thereby; the relative stability of different minerals. Configurational entropy terms arising from disorder also contribute to the energy and entropy. In transition metal compounds there are additional energy and entropy terms arising from the electronic configurations, leading to additional stabilizations, magnetic ordering, and, incidentally, color. Organized by Sue Kieffer and Alex Navrotsky, the course was presented by the ten authors of this book on the campus of Washington College in Chestertown, Maryland. This was the second of MSA's short courses to be given in conjunction with meetings of the American Geophysical Union.